In Exodus 30:34-38, YHVH instructs Moses concerning the incense that is to be made for YHVH’s altar. This incense was to be used solely for YHVH and not for anyone else. Each of the ingredients has much significance for us, both spiritually and physically. The first ingredient mentioned is stacte, which is a product of myrrh. Modern authorities believe that the stacte was taken from other sources, but ancient authorities equate stacte with myrrh. It seems more likely that the stacte YHVH intended was from myrrh because of its spiritual significance in Scripture. The wise men offered myrrh to Yeshua as a child (Matt 2:11) and Nicodemus supplied a mixture of myrrh and aloes for Yeshua’s burial (John 19:39). When Yeshua returns, Psalm 45:8 tells us that His robes will be scented with myrrh, aloes, and cassia (cinnamon). The Hebrew word for stacte is nataph. Both words mean drop or tear. The resin is naturally produced, but sometimes the plant is bruised In order to release more resin. To obtain stacte, the bark of the tree must be cut. The resin is placed in a container and hot water is poured over it. Lumps of myrrh resin and oil sink to the bottom and the water is drained off. Stacte is the liquid taken from within the lumps of myrrh. The lumps must be broken in order to obtain the stacte. Since ancient times, myrrh has been used in salves for cuts and sores, in rejuvenating facial creams, and in perfumes. Today, myrrh can be found in toothpastes, creams and cosmetics, and is recommended for healing a variety of illnesses including digestive disorders, arthritic pain, and regeneration of healthy cells, to name a few. The second ingredient is onycha, a Greek word meaning fingernail or claw. The Hebrew word is shecheleth, which means “to roar as a lion”. The root of the Hebrew word means to exude a fragrance. Once again, there are various opinions as to the source of onycha, but the most likely seems to be a type of rock rose. The flower petals resemble a human fingernail that has been painted red. The twigs and roots of the rock rose are still used for medicinal purposes. The final ingredient for the incense is pure frankincense, another aromatic resin. It is produced by slashing the bark in a process called “striping”. The hardened resins are called tears. The Boswellia sacra trees that produce frankincense are able to live in harsh, unforgiving environments and can even grow out of solid rock. The Hebrew word for frankincense is lebonah, which means “white”. YHVH commanded that frankincense be included in the grain offerings (Lev. 2:1) and meat offerings (Lev 2:15). A very pure type of frankincense known as lebonah zakkah in Hebrew, was to be presented with the showbread (Lev 24:7). Just as Yeshua shed His blood for our healing and restoration, the sap in the tree or shrub produces the resins that are so healing for us. The sap is the “lifeblood” of the tree or shrub. Yeshua only is pure enough to be our perfect sacrifice, even more pure than the purest frankincense. Sap or resin leaks out only when a tree is damaged or cut, just as Yeshua’s blood was released during His suffering and crucifixion. We can readily see how each ingredient in the incense points to Yeshua’s most precious sacrifice on our behalf. The incense was to be used only for YHVH just as Yeshua alone was worthy to be our sacrifice. Yeshua’s sacrifice is the most pleasing odor to YHVH, the most perfect expression of love. What does this mean for us? 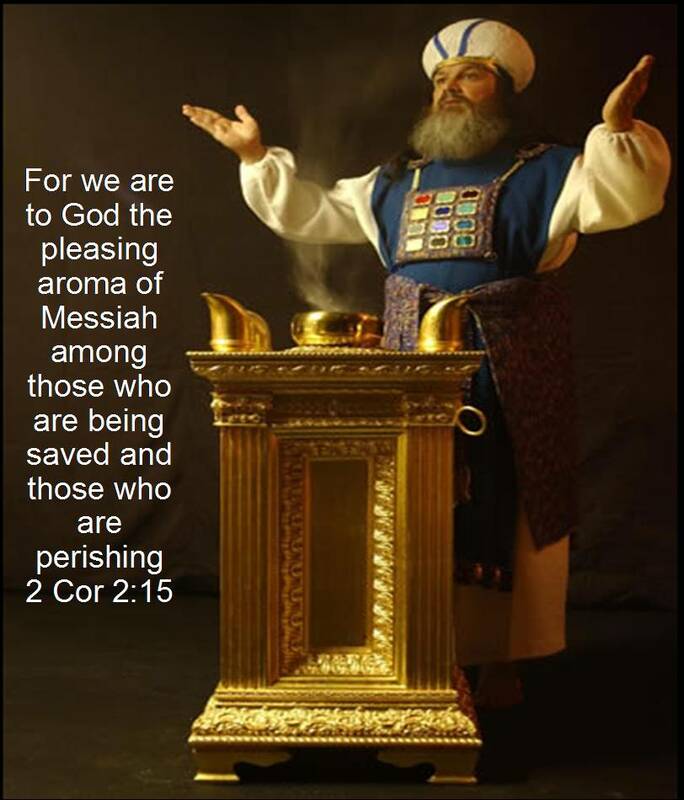 We see that the ingredients of this most sacred incense glorify Yeshua and point to His precious work of redemption. We are restored to YHVH and healed in body and soul. In Yeshua’s righteousness, we can offer ourselves as living sacrifices to YHVH (Rom 12:1). We too can be pleasing fragrances to YHVH. Truly loved this teaching! The Book comes alive when you know the culture and history of the people.